TheBlueGuerilla: Tory Youth Leader Colonel Cooper KFC Twitter Spoof. Tory Youth Leader Colonel Cooper KFC Twitter Spoof. TORY YOUTH LEADER Oliver Cooper seems to have fallen victim to a spoof Twitter profile based around his love for KFC and ongoing troubles within the Conservative Future (CF) National Executive, TBG can reveal. The account, @ColonelCooper, launched in the past 24 hours and has posted several images including Oliver Cooper in a KFC, with the tagline - "After a long day fighting the war on unsoundness, a quick stop on the way home at my favourite place". A spoof film poster seems to have been created and uploaded titled - "Being Oliver Cooper - Directed by Sarah-Jane Sewell". 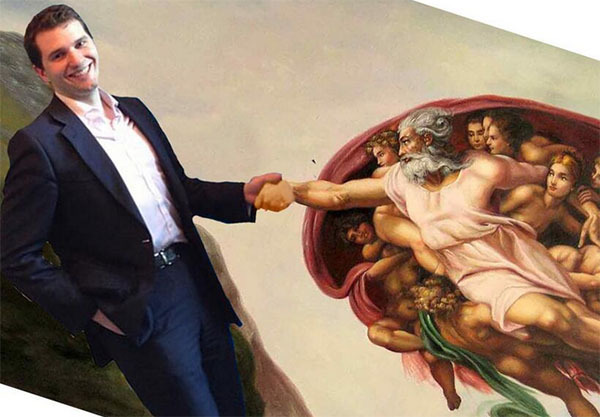 Another tweet depicts Cooper shaking the hand of God and sensationally proclaims Cooper will have his job soon. "Just bumped into an old friend of mine (don't tell him, but I think I'll be having his job soon)" - states the spoof profile. The origins of the account @ColonelCooper currently are unknown. Always remember when something big happens it is to distract you from the real story. Cllr Sam Fletcher got Jasmine pregnant at YBF, why will nobody report on this! ?